I was on facebook for a couple years, and I posted a lot of great jokes over those years, but since I had very, very few facebook friends (less than my dad, even) the jokes never got the recognition they deserved. Now that I have a successful blog, I want to give them another chance. Please like! I did it, folks. I finally made it through all 9 and 1/2 hours of Claude Lanzmann’s landmark Holocaust documentary SHOAH. But somehow, I don’t feel as good as I thought I would. Good wine, lively conversation, a home-cooked meal with friends...don't let these things distract you from winning at charades. Which aspect of “The Big Rock Candy Mountain” is most appealing to you? For me, it’s gotta be that lake of stew. MMMMmm!! My friend’s so into 90’s rap, he has a page-a-day PHARCYDE calendar! "Girls...they look like squirrels....they're always resting...on their laurels." a WINDOW is the best painting, man. It's the best piece of artwork you could possibly have. Jackie Chan is better than Bruce Lee. And he's better than every other actor, too. This Applebee's is crawlin' with gentiles. On my list of favorite rappers, Fred Durst is dead first. Happy TBT, fans! 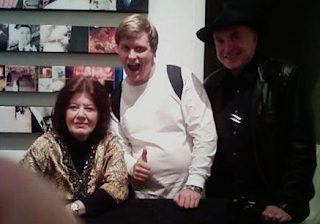 Here's an old flip phone picture of the time I met Anne Perry, aka Juliet Hulme of the Parker/Hulme murder case. You could've bludgeoned the sexual tension in the air with a brick! "The key to a funny joke is the element of surprise."